Water is one of the most plentiful and interesting substances on the planet. It has a variety of physical features. Our understanding of the ability of water to store energy and frequencies, is still only in its infancy. In the 1990’s, Dr Masaru Emoto performed a series of experiments where he observed the effects of words, prayers, music and environment on the structure of water. He had photographs taken before and after exposing the water to the different variables, and then froze the water so that it would form a crystalline structure. As you can see, the water molecules that had been exposed to prayer, as well as the water molecules from a clean lake have an even structure, while the water before prayer, and the water from a polluted lake do not. … for our trip to Europe we tried using the words “thank you” and “you fool” in German. 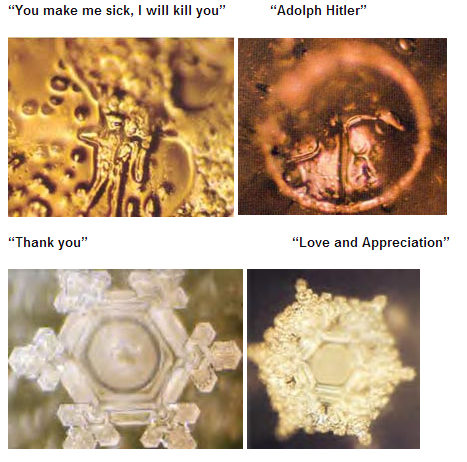 The people on our team who took the actual photographs of the water crystals did not understand the German for “you fool”, and yet we were able to obtain exactly the same kind of results in the different crystal formations based on the words used. So what does this have to do with orgonite? 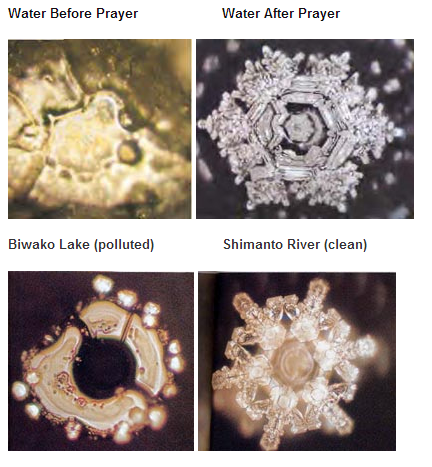 Well, Dr Emoto’s experiments show how easily water is influenced vibrationally. For this reason, orgonite is especially effective when it comes to harmonising and balancing water. Many people use orgonite charging plates to revitalise their drinking water, and often the change in taste can be observed after only a few minutes of charging. Orgonite helps protect against the negative effects of fluoride and chlorine. Orgonite gifters have also found that the efficacy of gifting increases when orgonite is placed in water. Many people gift lakes, rivers and oceans. Some people even put orgonite in their toilet tank in order to keep a steady flow of orgonised water running through the water system. Nice site, lots of info. I have been using and making orgonite for a few years now, Its very powerful , and enhances ones intent by clearing the EMR from the area where the orgonite is present. I did an experiment yesterday .. freezing water and then having a look at the ice formed from the 2vessels. one had a piece of my orgonite underneath , and the other none. see pics below. Thanks for the comment and the compliments 🙂 Orgonite doesn’t remove fluoride or chlorine – it protects against their negative effects. Orgonite works on an energetic level, not a physical level. Of course, energy fields affect the physical, but not (usually) in such a direct manner. But if we posit that fluoride and chlorine cause imbalances in the energy field of water, as well as imbalances in our bodies when we consume said water, then orgonite helps by harmonising those energy fields. Not by removing the chemicals, but by rectifying the imbalances that they have caused. Water is a cleanser used in baptism to purify the soul. I am careful to use only organic cleansers, toothpaste, and deodorants. I eat an almost 100% organic diet. I engage in contemplative prayer called, “Lectio Devina” daily. I noticed that I feel an increased amount of energy movement in my body while taking a shower. I feel certain that my body, mind, and spirit are transforming to a more positive state. Do you have any information regarding the merging of Catholicism and organite? I replied to the comment you made on my post about healing energy blockages. I don’t have any specific information about Catholicism and orgonite, but it sounds like you’re on a great path! I agree that water is an amazing energy cleanser, so it’s probably no coincidence that it’s used in baptism. How do i use it to rebalance water with fluoride ? Get a large flat piece of orgonite and use it as a charging plate.